Working for nearly thirty years with and for leading companies including Citigroup, American Express, Epsilon, Apple, and Fidelity -- with notable political and not-for-profit campaigns along the way -- Steve Cone has the kind of hard-earned, high-level experience that translates into valuable, tested ideas on what really works -- and doesn't -- in marketing. 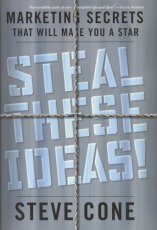 In Steal These Ideas!, Cone delivers hundreds of pearls in a sharp, no-nonsense, and witty style on all facets of marketing, branding, and advertising with all the candor and freshness you'd expect from a knowledgeable good friend in the business. Illustrated throughout with examples of the good, bad, and ugly in advertising, this is the secret stuff that no one ever teaches. Steal these ideas and become a marketing star today!